First book in a great new horror series! 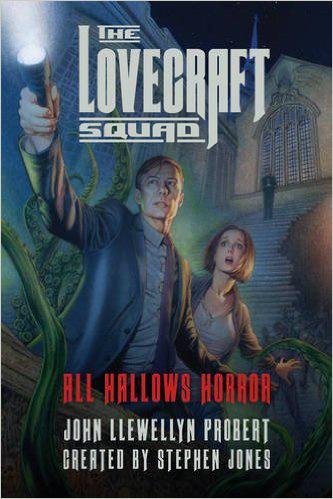 The Lovecraft Squad, also known as The Human Protection League, exists to battle the horrors of the Elder Gods such as Cthulhu and their myriad descendants and human servants. So when a Cthulian Horror rises in England, an ancient church is ground zero for horror unimagined. The League sends Doctor Bob Chambers to investigate. Bob is drawn into a four-day isolation investigation in All Hallows Church. The church has been abandoned and was even desantified by the Catholic Church. But the investigation is being pushed by an intrepid reporter and her newspaper. There are seven people in the group. The reporter, Karen Shepworth; Doctor Bob Chambers; historian Dr. Rosalie Cruttenden; so-called Parapsychologist “Dr.” Peter Chesney; Father Michael Traynor, represeitive of the Catholic Church; and contest winners Paul Hale and “Ronnie” Quesnel. These seven enter the church, Father Traynor having arrived first to open the place. The doors are shut and locked. They will open in four days, or if the panic button installed just inside doors on the wall. Things begin to go wrong from the start. No amount of preparation could have prepared these seven people for what they will endure. This is perhaps one of the best horror tales I have read in recent history! The first chapter is a bit rough, loaded with f-bombs from the two boys who discover the artifcats. But after that the pure horror begins and rushes the reader like a charging bull which will chase him or her all the way to the last line! What lies down below?